Let's talk about what TL-30x6 means. This is Underwriter's Laboratory's rating that is recognized worldwide. To get this rating, a safe is tested on all six sides by knowledgeable men with very powerful tools, including drills, chisels, sledgehammers, wedges, power saws, carbide disc cutters, and other miscellaneous tools for a period of 30 stopwatch minutes at a time, over and over. If the safe passes these tests it is awarded the TL-30X6 label and becomes sought after by banks and jewelry stores. A TL-30X6 is considered to be twice as strong as a TL-30 safe. The Amsec CFX TL30x6 Jewelry Safes give you commercial protection for your valuables with two hour fire and TL30x6 insurance ratings. The body and door both integrate the high-density insulating materials that tolerate an extremely high fire rating of two hours at 1,850 degrees F. In other words, if you were to have a 1,850 degree fire for two hours, the internal temperature stays under 350 degrees the entire two hours. Paper scorches at approximately 410 degrees, and will ignite at 451 degrees F.
This safe sets the standard for high-security and fire safes, and it has everything to ensure you have the best protection possible. The U.L. 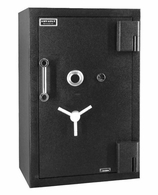 TL-30x6 rating on this safe allows for potentially insuring contents up to a half million in a commercial environment. The rule of thumb is that you can possibly get up to a million insured at home. The AmSec Amvaultx6 TL-30x6 is the ultimate in protection. This small button will not allow the door to close while the bolts on the Amsec Amvault TL-30x6 high security safes are in the thrown position, thus saving extensive repair costs to bolts and safe. The hinge on the Amsec Amvault TL-30x6 safes are on the outside of the safe, allowing the door to swing open and clear the interior of the safe for putting things in and taking them out. 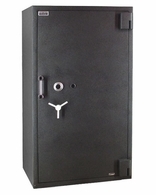 For extra protection equip your Amsec Amvault CFX TL30x6 high security safe with an optional key lock. 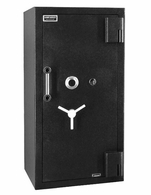 The key lock can be used as a "day lock" to lock the safe without turning the dial. High security key lock has two keys and escutcheon plate. 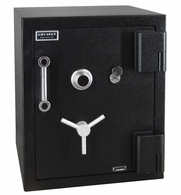 Dean Safe stocks these safes with all three options to give you the best protection possible. Use this diagram to reference the dimensions of the American Security Amvaultx6 TL-30X6 High Security Safes in the chart below. The diagram displays a TOP VIEW of the safe. Amsec CFX252016 25 x 20 x 16 31 x 26 x 25.25* 5 25 x 20 1,433 6" 1 25.25" 26" 48.75" 47.25"
Amsec CFX352020 35 x 20 x 20 41 x 26 x 29.25* 8 35 x 20 1,946 6" 2 29.25" 34" 60.75" 63.25"
Amsec CFX452020 45 x 20 x 20 51 x 26 x 19.25* 10 45 x 20 2,343 6" 3 29.25" 26" 52.34" 47.25"
Amsec CFX582820 58 x 28 x 20 64 x 34 x 29.25* 19 58 x 28 3,418 6" 4 29.25" 34" 60.75" 63.25"
*Add 2.5 inches to depth for lock and hinges. Due to their construction safes dimensions sometimes vary a slight amount. Dimensions are subject to change without notice by the manufacturer.